Clipped Wings supports people with developmental disabilities. Prior to our involvement with Special Olympics hundreds of thousands of dollars were contributed by local chapters and the national organization to charities working with the developmental disabilities. 1987: South Bend, Indiana. During International Special Olympics Summer Games, Clipped Wings unique idea of a reception for parents of athletes was first held to great acclaim. 1989: Reno/Tahoe, Nevada. Reception for parents of athletes repeated at International Special Olympics Winter Games. 1991: Twin Cities, Minnesota. 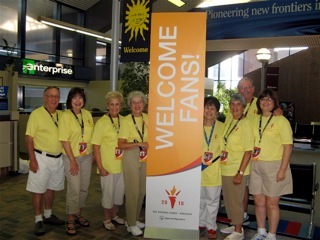 Members hosted Parents Reception at the International Special Olympics Summer Games as well as provided assistance for Cessna Airlift of athletes by corporate jets. 1993: Salzburg & Schladming, Austria. Participated in first out-of-USA locale for Special Olympics International Winter Games with Parents Reception and help at Family Centers. 1995: New Haven, Connecticut. 3,200 parents and guests attended our fantastic Parents Reception and we gave out more than 36,000 awards at 19 sports venues! 1997: Toronto/Collingwood, Ontario, Canada. Nearly 2,000 athletes from 73 countries competed in five Olympic-type winter sports. Another successful Parents Reception hosted by CW, friends and family members. 2001: “Anchorage, Alaska.”The Glimmer of Starshine was the theme for the Clipped Wings eighth reception for parents of the athletes participating in the Special Olympics World Winter Games. 2005: Nagano, Japan. The 2005 Special Olympics World Winter Games was our 10th Parents Reception and the first Games in Asia. 2006: The first Special Olympics USA National Games were held in Ames, Iowa with great success. Over 125 members, family, and friends were on hand to help with the Cessna Airlift -inbound and outbound. Clipped Wings hosted the 11th Reception for Parents at the beautiful Reiman Gardens adjacent to the Iowa State University campus. 2009: The state of Idaho hosted the 2009 Special Olympics World Winter Games from February 6-13. Clipped Wings members were there and able to volunteer at figure skating, speed skating, floor hockey, and Healthy Athlete venues. Our western themed Family Reception was a hit! 2010: Lincoln Nebraska was the site of the 2010 Special Olympics USA National Games. Clipped Wings members flew in from all parts of the US to offer their services. We welcomed 700 athletes flying in on private Cessna airplanes plus1200 athletes coming in on commercial flights (OMA & LNK). We hosted our well-known Parent’s Reception and were delighted to entertain 1200 family members!